High reliability connector series now includes multiport coaxial cable connector with strong RF performance characteristics. Harwin continues to strengthen its portfolio of interconnect products designed for implementation in harsh application environments with new additions to its flagship Datamate high reliability connector (Hi-Rel) product family. With the objective of addressing space-constrained RF/wireless designs, each member of the Datamate Coax series comprises multiple (ganged) coaxial contacts in a compact housing. 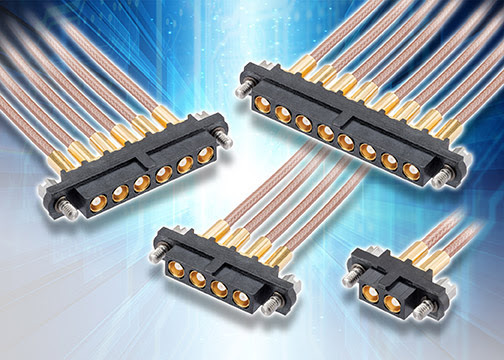 As they provide access to numerous coaxial lines through a single connection point, these components present engineers with a highly convenient, space efficient and cost effective way to address diverse connectivity requirements. Featuring 2, 4, 6 and 8 contact options, the contacts contained within each Datamate Coax connector are arranged into single or double ended jack formats with 4.00mm pitch. They deliver strong RF performance characteristics up to frequencies of 6GHz. The connectors’ inherently robust construction means that they can cope with high levels of shock (100G) and vibration (10G/200Hz), plus extreme temperatures (-55 °C to +125 °C). Among the key application areas for the space-saving, heavy duty Datamate Coax connector series are avionics, radar, robotics, industrial automation, military and medical, as well as general wireless communications. Benefitting from the technical expertise of Harwin’s engineering team and the company’s proven track record in a broad range of challenging Hi-Rel application scenarios, the accompanying cable assemblies ensure long term operational integrity while mitigating the related tooling costs that OEMs face when carrying out this work in house. The cable lengths available are 150mm, 300mm and 450mm.